Industrial gases cover many applications, from propane for your forklift to liquid nitrogen for cryogenic preservation and other specialty gases for research labs. Josef Gas carries many of the most commonly needed gases for laboratories and cryo facilities throughout the Greater Toronto, Kitchener, Waterloo and Cambridge areas. Argon – Argon gas is used in mass spectrometers and other analysis instruments to measure atomic absorption and emission. It is also used to produce plasma energy for atomizing or ionizing samples. Hydrogen – Hydrogen gas is used both as a carrier and as a combustion gas, depending on the application. It is most commonly used in a lab setting for gas chromatography, and atomic absorption and emission spectroscopy. Helium – Helium gas is the most common carrier used in gas chromatography. Liquid helium is used to cool magnets in NMR and MRI systems to reduce their electrical resistance, allowing them to exhibit superconductive properties. Nitrogen – Nitrogen gas is commonly used for stripping oxygen, soluble contaminants, and moisture from fluid samples to ensure purity and viscosity. It is also used to render flammable or combustible substances inert, to prevent explosions and fires in a lab setting. Liquid nitrogen has many lab applications, including freezing and preserving tissue, gas adsorption processes, cold traps, and superconducting equipment like MRIs and NMRs. Oxygen – Oxygen is used to create combustion during elemental analysis, and to stimulate cell growth in incubators and bioreactors where bacteria, animal cells, or plant cells are grown in a controlled environment. Carbon Dioxide – Carbon Dioxide is used in fluid chromatography as the primary mobile phase. It is also a key metabolite and pH-regulating agent in bioreactors and incubators for bacterial growth or animal and plant cell growth. 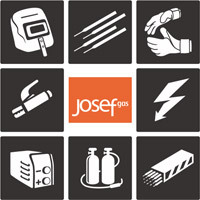 Josef Gas is an independent supplier of industrial gases in and around Toronto. We have more than 40 years’ experience in providing pure gases and precise blends for all types of applications. We operate our own fleet of delivery trucks to provide our customers with delivery service as excellent as our products and customer service. Our long-term relationships and contracts with our suppliers, in combination with our low overhead, ensure that we can give our customers value pricing on all of our gas products. Call us today at 416-658-1212 to learn how Josef Gas can supply your laboratory with the gases your lab needs for its critical applications.